Ever since I first encountered the GUMSHOE system, I have been thinking that it would be perfect for the sort of spy games I like to run and play… and this book fulfills that desire! In it, Ken Hite has distilled the essence of the cinematic yet gritty spy thriller and woven it through the core GUMSHOE mechanic – and added the twist of vampires into the bargain! The Introduction lays out the basic premise. This is not just any spy game. It has a very specific slant, taking the view that in the aftermath of the Cold War a lot of people who’d been earning their keep on the back of the efforts of East and West to monitor (and interfere with) each other now found themselves at a loose end, and had to put their somewhat dubious skills to profitable use in a freelance market – mercenary spies for hire, if you will. Frequent reference is made to movies and TV shows that present the appropriate feel, and if you enjoy them, it’s likely that this game will work for you, at least at the ‘spy’ level. As has been done with other GUMSHOE games, there are various ‘modes’ in which you can run your game and each is denoted by a small symbol – these are used to denote optional rules appropriate to your chosen mode, and other snippets of information useful to that style of game. This allows you to fine-tune the mood of your game so that it becomes precisely what you are after. The first section looks at creating and running characters: the rules you need to generate your agent then equip and play him in the swirling underworld of post-Cold War Europe. It is recommended that players work together to create a rounded team of agents who between them cover all the areas of expertise that they need: particularly important given the investigative nature of this game as well as to ensure that the technical abilities of various spy specialities are represented – the classic gunner-and-runner, the computer specialist, the driver, the bang-and-burner (a destructive role specialising in explosives, arson attacks, etc.) and so on. The assumption is made that everyone is a competent all-round agent: they have, after all, been operating at the highest level for a while before the game begins. This is not a game about raw recruits, or ‘ordinary people’ suddently thrust into the cloak and dagger world. There’s a lot of detail both about skills and backgrounds, to aid you in creating realistic agents who will be fun to play and who are embedded thoroughly into the setting. The next section is Rules. Here are the core mechanics that make the whole game work, beyond the actions of the characters themselves. The key GUMSHOE concept, that clues essential to the plotline WILL be found in play, is emphasised, but the way in which characters are designed is intended to facilitate this without it appearing forced. A core assumption is that, as competent and experienced operators, a lot of the time the characters will succeed at whatever they decide to do… the art is in deciding what to do and describing how they go about it in appropriate style. It is all flavourful in the extreme, and whilst there are game mechanics involved, these can be internalised so that play is not interrupted by die rolls that carry the possibility of derailing everything – there are still plenty of opportunities to get it wrong, for the characters to find everything falling around their ears: but a single botched die roll is unlikely to be the cause. This is followed by Tools. Not just the ‘tools of the trade’ but how to acquire and use them to best effect, keeping in mind always the cinematic thriller style that the game aims to achieve. This also includes developing strategies and team-work – and tradecraft – as well as the physical items the well-equipped (or ‘joke-shop’) spy always seems to have to hand. There’s even a rule mechanic for that – Preparedness – where a character is enabled to just happen to have the appropriate item when he needs it, although he does need to come up with a plausible reason. That is one of the joys of the system as a whole, any action can be enhanced by giving an outstanding in-character description of what you are doing – consider those little monologues on tradecraft scattered through the TV series Burn Notice for example. This section ends with some excellent advice for players on how to approach the game. This is where we leave material for everyone and move more into GM (here, Director) territory, starting with a chapter Vampires. However, so much is left to individual Director whim that curious players will not spoil things by reading on… While it is a given that the core enemy is a vampire conspiracy, the nature of the conspiracy and indeed of the ‘vampires’ themselves is open, although a whole raft of suggestions are presented here, from Bram Stoker-style ancient horrors to aliens, creatures from folklore (have you ever stopped to wonder just why nearly every culture has vampire legends? ), black magic or even a disease; and as to what these vampires might actually be up to… well, that’s for the Director to decide and the characters to find out. There is a lot here for the Director to ponder. Bear in mind that this is not a game you buy one afternoon and run that night: to make it work you will need to put in a fair deal of planning, even though once the core plot is determined it is a game that runs well in improvisational style, using ideas that come out of your collective storytelling to determine what happens next. Here is introduced a core mechanic to keep tract of what is going on: the Conspyramid. This tracks the layers of your conspiracy – people, groups, and their specific aims, as well as how each is linked to the others – and provides a structure through which investigating agents can move as they discover what is going on, peeling back the layers as their investigation proceeds. Leaving the structure relatively open allows for future developments: ideas may strike long after the game has begun, but this process facilitates incorporating them – and even theories that the players come up with that are just to good to ignore – during play. It can also provide a loose ‘road-map’ for your campaign, if you imagine it proceeding from lower levels right up to the kingpin at the top. It’s a brilliant concept, and worth considering for any conspiracy-based game, vampires and spies or not. Several ‘quick-and-dirty’ city descriptions, and one (Marseilles) detailed extensively, are followed by a section on Stories, explaining the general nature of what might well go on in the game – the various approaches that the characters can take in their investigations, and the strategies that the conspiracy will employ to thwart them. It won’t be long, after all, before the conspiracy becomes aware of the agents and decides that it might be best to deal with them before they become too much of a problem! There is a wealth of advice here not just on the stories to tell, but how to go about ensuring that the shared story is told to best effect given the style and flavour you have chosen for your game. Finally, an introductory adventure is presented in all its glory. (S)entries will sweep agents into the heart of affairs from the outset, whilst introducing itself as a simple task that any freelance ‘mercenary spy’ might expect to be hired to perform. Be warned, though, whilst quite detailed as to what is going on and what the characters should be able to discover, this – like the whole game – requires preparation, it cannot just be picked up, read once, and played. The work put in will repay the effort, however, the potential to start your campaign in high epic thriller style is there from the outset. This product makes the most of the GUMSHOE mechanic, incorporating it well into spy thriller mode and giving you all the tools you need to set up conspiracies for agents to investigate and destroy. 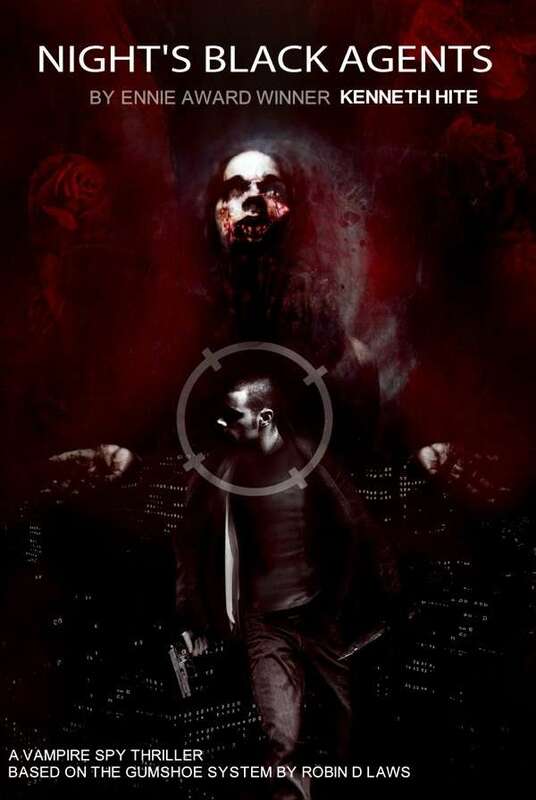 Although the idea of vampires being behind it all is presented as an integral part of the game, if you prefer a different form of conspiracy (fans of Jason Bourne, or those who are convinced that all manner of plots are hatched in Davos, may step forwards here) it will work perfectly without fangs and a thirst for blood. If you do like vampires, this game is a delightful twist on other games involving them, a whole new set of stories to tell.